When Michelle Obama isn't carrying out her duties as First Lady, she's conspiring with the writers of the Ultimate Spider-Man comic book series to destroy America for racists like Glenn Beck who don't want to see a non-white Spider-Man. 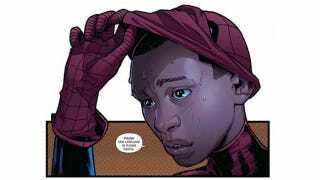 In an alternate universe storyline, the late Peter Parker is being replaced by Miles Morales, a half-black, half-Hispanic (heterosexual) teen. Beck is convinced this is a sign of our impending doom, because that's how his barely-functional mind works. Do I care if he's half-Hispanic, all Hispanic? No. Half-black, all black? No. I really don't care. Half-gay, all gay? I don't really care! I don't care. It's a stupid comic book. However, what I do care about is that I think a lot of this stuff is being done intentionally. Barack knows we're going to have to make sacrifices, we're going to have to change our conversation, we're going to have to change our traditions, our history. We're going to have to move into a different place. Says Glenn, "Gosh, that seems to fit, doesn't it?" Uh, no?